La Bagnaia Golf & Spa Resort Siena, Curio Collection by Hilton was once a medieval village that dates back to the 11th century. 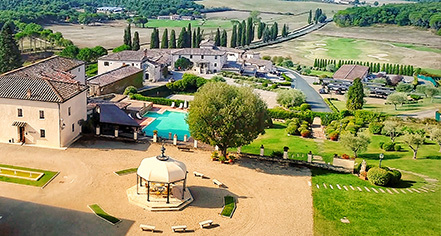 Nestled in the enchanting Tuscan countryside and surrounded by incredible views over rolling hills and cypress trees, La Bagnaia connects its guests to the very heart of Tuscany. The lush, wooded Tuscan landscape provides the perfect backdrop to this historic resort, with the city of Siena, a UNESCO World Heritage Site, located nearby. La Bagnaia offers authentic Tuscan accommodations that pay homage to the history and character of the area. Set across two medieval hamlets, Borgo Bagnaia and Borgo Filetta, the guestrooms and suites at the resort come with all the modern amenities, Tuscan décor, and atmosphere. The wellness spa, Buddha Spa by Clarins, offers refreshing treatments in a relaxing environment. Guests can take a dip in the outdoor thermal pool dominated by the 4 meter waterfalls from the Santa Caterina springs in the background, enjoy an indoor pool, signature treatments, sauna, and a Turkish bath. Dedicated to the conquest of harmony and tranquility of the senses, as well as the healing effects of its natural thermal waters, it has been known since the 13th century as the spring of Santa Caterina, and has been frequented by Popes, cardinals, and aristocrats attracted by the prodigious properties of these waters. Play a round of golf at Royal Golf La Bagnaia, an 18-hole golf course designed by Robert Trent Jones Jr. Set in the Tuscan landscape, Royal Golf La Bagnaia is a typical example of Inland Links, which refer to the Scottish Highlands with the “Rough” that waves in the wind, making it one of the finest and most beautiful golf courses in Italy. 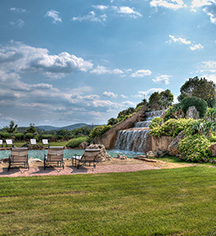 Indulge in authentic Tuscan dishes at La Voliera Restaurant, enjoy a cocktail poolside overlooking the Tuscan hills, or catch up with friends over traditional dishes made with only local ingredients in an informal environment at Antica Posta Filetta. After a round of golf, enjoy a light lunch or snack at the Golf Club House, overlooking the golf course and the city of Siena. The family-friendly hotel offers activities for children, including biking, hiking, cooking classes, and picnics. Nestled in the heart of Tuscany, La Bagnaia Golf & Spa Resort Siena, Curio Collection by Hilton is located in a scenic region of Central Italy with a rich cultural heritage. The historic center of Siena, a UNESCO World Heritage Site, is 12 kilometers from the resort and includes museums, public plazas, art galleries, churches, and medieval architecture to explore. The famous Palio Horse Race is held twice yearly, in July and August. Guests can visit the Torre del Mangia for towering views over the city, see the stunning frescos at Biblioteca Piccolomini, or simply stroll the beautiful narrow streets. It is a short journey to San Gimignano, Montalcino, Monteriggioni Chiusdino, Murlo, and treasured museums, vineyards, and architecture, including San Galgano Abbey, home of the 'sword in the rock' story. Other provinces in Tuscany hold enticing options for a day trip - the Leaning Tower of Pisa, the Chianti wine region, and the city of Florence, with its treasures, are all 90 minutes or less from the resort. La Bagnaia Golf & Spa Resort Siena, Curio Collection by Hilton, a member of Historic Hotels Worldwide since 2018, dates back to the 11th Century. The owner of the property, an enthusiast of Asian culture, brought back a selection of Asian art and antique pieces from many travels in Asia, which can now be found throughout the Resort and especially in La Canonica, the old vicarage house turned small museum. Hotel/Resort Fees & Taxes: There is a $2.50 EUR per person, per night tax. Pet Policy: $20.00 EUR per pet, per day. Restrictions may apply. Shuttle Service: Free shuttle service throughout the Resort, upon request. La Bagnaia Golf & Spa Resort Siena, Curio Collection by Hilton was once a medieval village that dates back to the 11th century. Nestled in the enchanting Tuscan countryside and surrounded by incredible views over rolling hills and cypress trees, La Bagnaia connects its guests to the very heart of Tuscany. Learn more about the History of La Bagnaia Golf & Spa Resort Siena, Curio Collection by Hilton .